Happy Easter, originally uploaded by captainjay. Deb and I are still out and about on the boat. 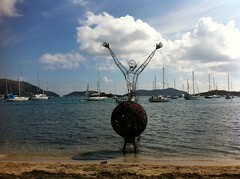 We went over to Trellis Bay this morning for breakfast, after staying at Marina Cay last night. We have been over at Cooper Island Beach Club for several hours. We swam some, I actually cleaned barnacles off of the boat, and just generally hung out. Just finished up a great lunch and getting ready to start back towards St Thomas.